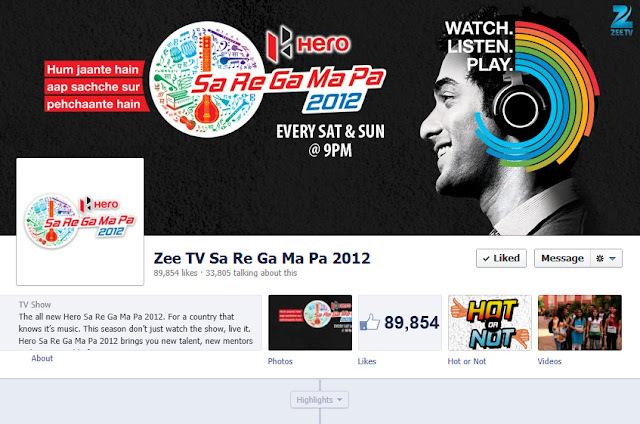 ZeeTV debuted their popular music show franchise Hero Sa Re Ga Ma Pa’s new season last week. They created a lot of buzz on the web through their campaign. The campaign tagline being ‘hum jaante hain aap sacche sur pehchaante hain’, all executions are being aligned to this thought. Zee TV took over nearly every publisher home page with some really interactive executions, through the launch week. Banners had timed quizzes with varied themes like Guess the Song, Pictionary and Arrange the Lyrics. Music lovers would have had fun engaging with these rich media renditions. The Facebook page created specifically for the show hosts an application called ‘Hot or Not’ where fans can pick their favorite performances by voting for them. Wall posts share latest contestant videos and are used to create excitement in the run up to the show. A Twitter handle dedicted to the show, @saregamapazee provides live performance updates. The show also has a mobile activation promo where fans can call a number, sing their favorite song and share it on Facebook. Zee TV's website also runs the program promotions in their hero slot. All in all, a well tied together campaign.